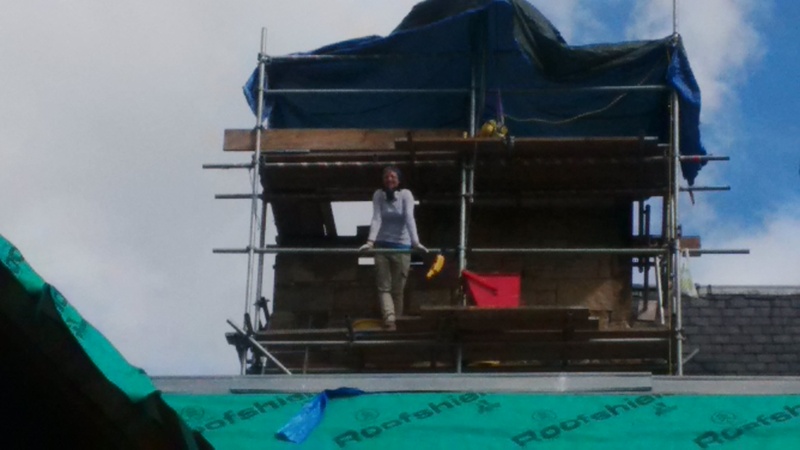 In June collaborated with Kate Wallwork on the rebuild of this very large Victorian chimney stack. Scotland’s unprecedented heatwave conveniently gave way to wet weather and saved the lime from overdrying, hence the tarpauline to protect us from overwetting. This project was to make and build replica stone chimneys for the gate lodge at the gothic Margam Castle near Swansea. An example of rope access avoiding the need for scaffolding, the pre-built stack pair were lifted into place by crane.